Kim Waale has completed artist-in-residence in Spain (2010), Macedonia (2008), and Ecuador (2007) and has received grants and residencies from organizations including I-Park, Sculpture Space, Light Work, the International Studio and Curatorial Program in NYC, the Saltonstall Foundation and the Millay Colony. In addition to recent exhibitions at Memorial Art Gallery in Rochester (where her work won multiple prizes), the Everson Museum and the Warehouse Gallery in Syracuse and her work has been shown in at Hallwalls Contemporary Art Center in Buffalo, the A. I. R. Gallery in NYC, the McCormick Freedom Museum in Chicago, and museums and galleries in Wales, Bulgaria, Macedonia and Spain. In 2003, she co-authored the book A Due Voci: The Photography of Rita Hammond (Syracuse University Press) with Dr. Ann Ryan and Dr. Julie Grossman. She is a Professor and the Director of Studio Art at Cazenovia College in Cazenovia, NY. Kim Waale makes site-based installations that simulate nature – whimsical fictions, slippages between reality and artifice. Her installations are made of dumb materials and yet, they’re plastic sublimes – romantic natural hybrids. The unnatural materials used to construct these artificial landscapes are readily evident: ordinary plastic wrap, rubber, and Styrofoam. By making these materials self-evident, the illusion of landscape disintegrates even as it is being created. “Manlius-based artist Kim Waale has but one work in the show, an exploration of artifice in a room-sized installation titled “Simulacrutopia (again),” which alludes to a simulated representation of a near-perfect reality. The work is gently contemptuous toward our so-called love of nature, referencing our replacement of natural settings with surreal, sterile representations of itself for our recreational desires. 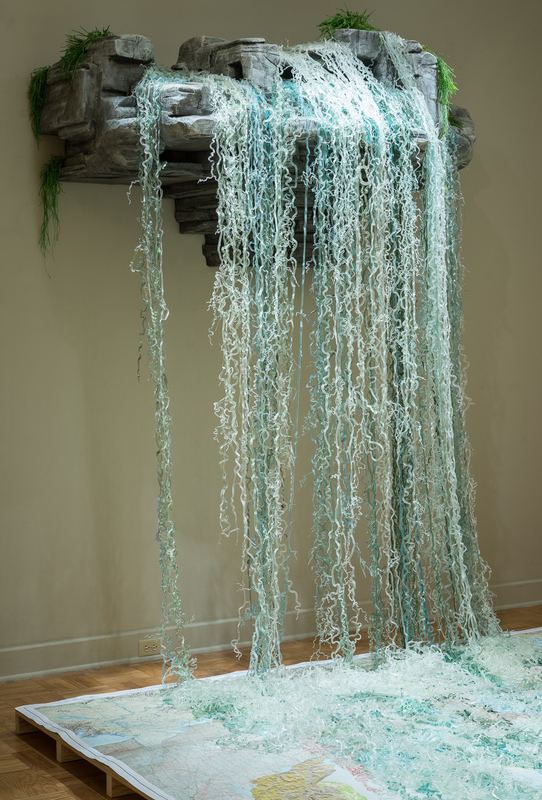 At one end of the room, an outcropping of foam “rocks” juts from high up on the wall, with cast-rubber “rivers” falling in tendrils which trail off in a freeze-flow across a low collage of maps. 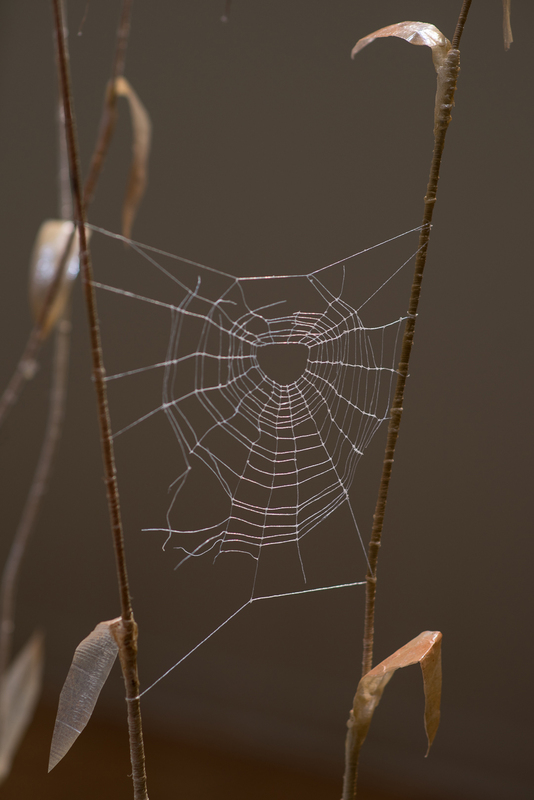 Spun and spray-painted plastic wrap over wire effectively simulates rushes and reeds sprouting from the reordered islands and continents, and remnants of animal life, such as spiderwebs or antlers, are mere decorative relics. A mechanical songbird, set off by a motion detector, acts as a threshold guardian, releasing a jarring cry as viewers enter the environment.